Welcome to All Fired Up. 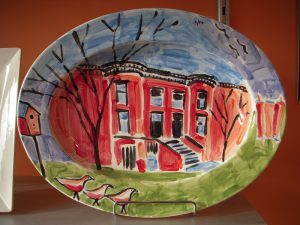 I opened the doors in May 2004 as a paint your own pottery studio. Since then, we have expanded to offer mosaics, ceramic fusion, and fused glass, and acrylic painting. I have always believed that everyone should have access to making art. That is true at All Fired Up! 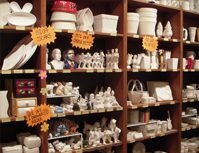 We have pottery that start at $2, without any additional costs, but the average cost is $20-$25. As the owner, these studios are my “homes away from home”! Below I offer just a few great reasons to come in and be creative with us. Reason 1: All Fired Up is a local, family business. I am not part of a large franchise operation. I was born and raised in the DC area and majored in art and education in college. 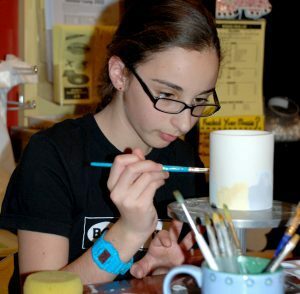 My dream was to open a studio to combine my love of art with teaching children and adults the joy of self-expression. Reason 2: I charge only one price for the pottery piece or mosaic you select. Reason 3: All Fired Up offers a great range of products. I am not tied to any one supplier so I’m able to select the highest quality items from across the nation. Also, I can research and order any specialty items you may wish to paint. Challenge my research — I haven’t been stumped yet! Reason 4: At All Fired Up you can become a VIP — a Very Important Painter — on your very first visit. You join for free and for every $200 spent on pottery or mosaics you will receive a special $20 credit towards your next purchase. Parents tell me it’s great for bonding and communicating with their children. Kids especially love this idea because they can carry their own VIP card with pride.